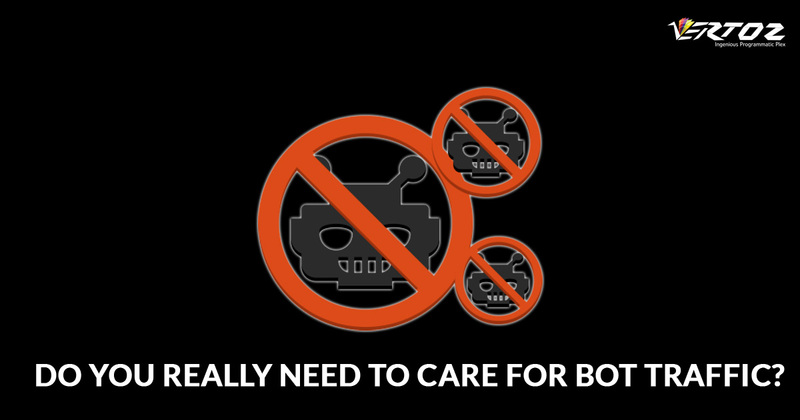 Blogs | Do You Really Need to Care for Bot Traffic? The first thing we need to understand is what a Bot or Spider is, right? Do you really need to care for bot traffic? Why? In this blog basically, we are going talk about the bot, identifying them and how they are affecting both the publishers and advertisers in this programmatic industry. Bots are basically automated computer programs, not individuals, that are hammering your website. They do it for numerous reasons. There are good bots and bad bots. Sometimes it’s a search engine viewing to list your content on their site or it’s a program observing your blog. There are good bots and there are bad bots. Good bots index and crawl your site and bring in traffic on another hand. Bad bots munch bandwidth and signals, slow down your server, snip your content and look for susceptibility to conciliate your server. Search engines use bots to crawl websites so that they can return relevant search results to users. Bots used by all the major search engines and we do not want to block these bots from crawling our website. Bad bots come in all extents and use diverse threads to identify themselves. There are many bots out there which may crawl your site with diverse heights of alacrity. However, traffic from bots is usually low-quality traffic that will twist your aggregated data. How to identify BOT traffic? On the first instance we as a company usually check for unwanted traffic during report and next, we look at the service provider’s report. So, what are we looking for in this report? Most of the bots have one thing in common, i.e. their sessions are 100 percent new as they cannot cling a cookie on them. Hence, they cannot remember when they hit the same site next time. So, service providers with an escalated percentage of new sessions and low engagement metrics such as page session or average session duration are doubtful. To add a further hint to the case, you should check conversion rates also, i.e. bot traffic rarely adapts, especially if the goal comprises data entry such as form completion or an acquisition. This visual method is of course very unpolished and will spot only those obvious and palpable bots. However, it allows you to quickly see if you have a serious issue which will help you decide what you do next. Or else you can sign up with those ad networks who offers click fraud prevention. Sign up with those companies who are experts in automated fraud detection and fully enabled to fight ad fraud more effectively. Companies which deals with sophisticated machine learning algorithms can accurately identify traffic from hijacked devices, botnets, malicious script injection and other automated means. Hence, better detection plus the ability to stay steps ahead of the bad bots. How will it affect publishers? The BOT traffic is affecting publishers directly! The fraudulent activity mostly escalates CTR or at times deals with low-slung CTR which will actually raise the alarm for the publishers. Bounce rate is always knocked out due to fraudulent activities and hence, it raises the alarm again. There are many points that have to be kept in mind as bots can directly or indirectly impact your image, especially when you are running ads from real time bidding (RTB) platform or various ad networks. Though to all these chaotic fraudulent activity, we have solutions by using Ad verification tools, however, we need to be watchful and make sure we take essential actions. How Google treats bot traffic if any publisher is such traffic? Bots are destroying advertisers in many ways rather than one. Not only brands are losing their charm for fake ad impressions, but bots are leading them to an incorrect path, where their efforts to reach real humans are terminated. Heaps of ad impressions are being served to non-human traffic and bots, which is a severe problem for the advertisers. The tricky part – bots often act better than humans, i.e. if a campaign is trying to grasp a certain target of clicking an ad or outlaying more time on a page, the bots will click more often and stay longer on that particular page. To regulate if anything is doubtful about your account’s traffic, Google encourages you to review your site’s traffic logs frequently and identify if there is a presence of any irregularities. They recommend you to a closer look at all your site’s log history and AdSense referral sites found in your web analytics tool reports. They encourage you to investigate any unusual increase in a particular traffic source from another website, country IP address, etc. Once you’ve identified a doubtful traffic source, you can then block that referral URL or IP address. Google always recommend that you should closely monitor any website before working with it. How will it affect advertisers’ campaigns? The prevalent threat of bot traffic is also affecting the advertiser’s side also. First, the threat that they face is content theft, where web scrapers are simply taking down content from sites. Second, the threat would lead to fraud and fake registrations which will form spam and bot-driven filling. Third is login attacks which lead to large numbers of failed username and password entries. Fourth, is click and impression fraud where bots are loading and clicking on the links. Issues with creating a remarketing list in ad campaigns? Retargeting or remarketing is comprised of each and every impression and it is retargeting the entire traffic, dead accounts, bots, etc. When individuals leave your site without buying anything, remarketing lists for search ads help you to connect with those potential customers. When these individuals continue looking for what they need on all the popular search engines remarketing list helps you to connect with them. You can create ads, set your own bid or select keywords because remarketing lists for search ads are enabled with these kinds of customizations. However, if half of your potential impressions are bad bots then you lose your campaign then and there. Bot operators try to gain as much income as possible through their fraudulent activities and hence they target more expensive ads. Your campaign list should be crisp and you should know whom are you retargeting because one impression is lost it is lost forever. The unauthorized placing of ads on sites can cause bot traffic. Try to sign up with those ad network companies who involve fraudulent traffic control rather prevention. As an advertiser try to update blacklists frequently and narrowly. As often as daily and control for ad injection by discussing this with your DSP or tech platform. Ultimately, bots and how they act differs across websites from one industry to another. The challenge is to identify the behavior pattern, to segregate it and then deal with it. We would love to know more about your opinion and comments on bot traffic. What issues have you faced with bot traffic? If you feel that you basically can’t belief your data, rather trust on it, get in touch with Vertoz to discuss your options and how we can help.